People always ask about my day to day life in Bali. Where I do my groceries, where I get my hair done, where I get good coffee? Below are the places that make My Bali tick. I have a coffee obsession. 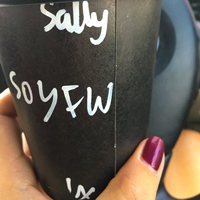 I drink Soy Flat White, preferably with Bonsoy. All my dreams came true when I found the best coffee in Bali, served Bonsoy! 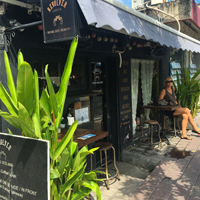 There is only one place for coffee in Bali for me and that’s Revolver Espresso or Baby Revs (the Baby Revolver), both in Seminyak. Other notable coffees are from Pison and Moose Espresso. I love eating out for breakfast. Particularly after a good workout! 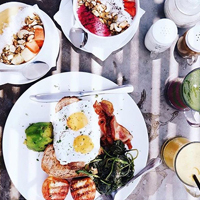 We live in Sanur (over the other side of the island from Kuta) and my favourite local breakfast spot is Soul in a Bowl. The menu has a great variety of healthy and colourful dishes! 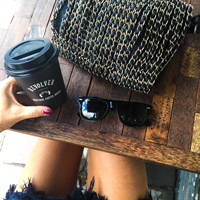 My other favourites are Crate Cafe in Canggu and Sisterfields in Seminyak. 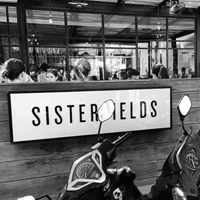 Crate and Sisterfields are both super cool for people watching, and great menus for the health conscious. It’s not all holiday stuff in Bali, we still live a relatively normal life with basic meals and dining at home through the week. 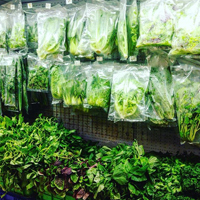 When we first arrived, I found it challenging to do a standard grocery shop. I now have it sorted. You can never find everything under the one roof. So it generally means you have three different stops to complete a shop you would do in one in Australia. 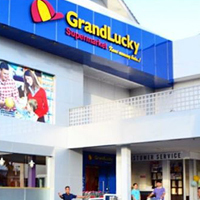 For the majority of my fruit & vegetables, food and household items, I shop at Grand Lucky in Kuta. They have many Australian brands and products. Closer to home in Sanur I shop at Hardy’s for one off or last minute requirements. 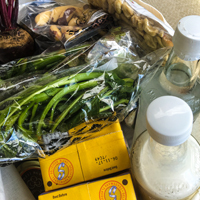 For all my health food requirements, such as Soy and Almond Milk, nuts and Almond Butter, I shop at Bali Buddah. I have always been blonde, with a few stints of red or strawberry blonde. I am best blonde, it’s me. It has been very hard for me to maintain my blonde colour in Bali, particularly with the water which isn’t great and constant swimming in the pool and beach. Finally I have found a hairdresser that rivals my hair goddess in Oz. Luxe Hair in Legian. Rochelle is an Aussie, who knows exactly what I want and how to achieve it. 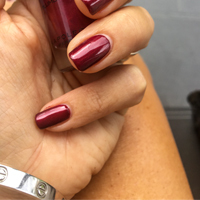 For my nails, the mecca for nails is Think Pink Nails in Canggu. Best manicure/ pedicure I’ve ever had, and a wall of colours that will spin your head. For everything else from Waxing, Lashes and Spray Tans (yes occasionally in Bali! ), I go to Glo Day Spa. Great reliable team and service for all beauty treatments based in Sanur and Seminyak. On Sundays it’s all about the brunch. It’s not really brunch as it generally starts at 12 noon, but they call it Brunch. 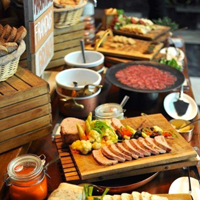 Most of the 5 Star hotels host a buffet style brunch with free-flow alcohol packages. The experience generally sees you settling in for most of the afternoon! My favourite is the W Hotel Brunch in their Starfish Bloo restaurant. The food offering is really diverse, the aspect is cool and general vibe is a winner. Great for the whole family. 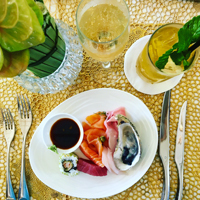 If you are looking for something a little posh, the Soleil Restaurant at the Mulia in Nusa Dua is exceptional. Not the best for kids, as it’s a bit more of a fine dining experience and more a special occasion venue. 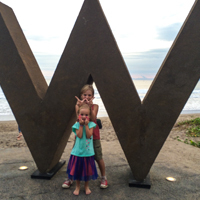 Probably the best value for money and family is the Cut Catch Cucina restaurant at the Sofitel in Nusa Dua. It’s more casual than the other two and you can also use the pool facilities after, which is a great way to finish the afternoon. Moving from the East Coast of Australia, you never tire of the novelty of seeing a sunset. If you’re on the west side of Bali, you are in for a treat come 6.30pm. A Bali sunset is mesmorizing, changing every second and something you will never forget. Here’s my pic of the best spots to catch it – preferably with a cocktail in your hand! Single Finn at Uluwatu is heaven on earth. Set up on the cliff you see it all unfold before you and with the addition of Bali’s best waves rolling through. 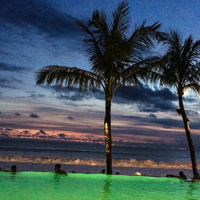 Potato Head is iconic in Bali for it’s pool and sunset drinks. The architecture of the building is stunning and in the sunset light, the experience is really cool. 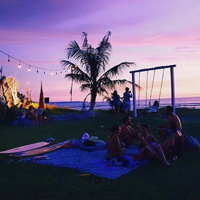 The Lawn in Canggu is the newest kid on the block for sunsets, and it delivers. All you need is a section of grass and the sunset – magic. 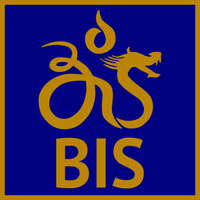 There are a number of International Schools in Bali. 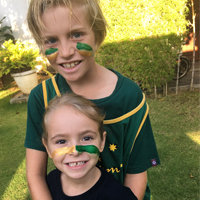 My two children, Spencer 9 and Billie 6, attend the Bali Island School. Formerly Bali International School. It’s an IB school (International Baccalaureate®) and we have been extremely happy with the level of education and extra curricula activities the school offers. 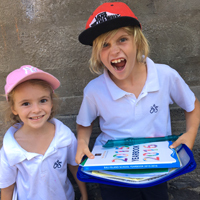 The kids settled into the school straight away and have made great friends. We have also benefitted from the social aspect of the school and have made some great friends also. To Beach or Beach Club? Bali is all about the sun and beach. There are so many amazing beaches and beach clubs on the island. Most weekends we will spend a Saturday or Sunday either hanging on the beach or in a beach club…. overlooking the beach! 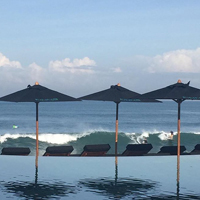 My favourite beach club with an awesome beach break to watch, is Komune Resort, north of Sanur. 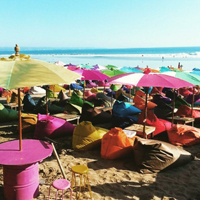 It’s out of the hustle of Kuta and Seminyak, offering a chilled, very surfie vibe. Awesome food and great tunes around the pool. 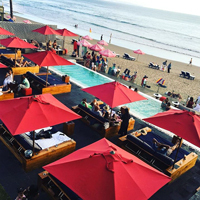 For more of a sandy feet experience, we go to La Plancha in Legian. Rent a couple of beds on the beach and enjoy the food and vibe of the iconic La Plancha Beach Bar & Restaurant. 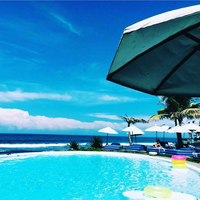 For something a little more sophistcated and for best people watching, the new Finns Beach Club in Canggu is where it’s at. 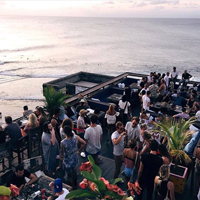 We have sampled so many good bars and drinking spots in Bali. Depending on what you’re looking for, whether it an authentic local scene for a Bintang, or a fancy cocktail location, Bali has it all. I have three options to cover all bases. 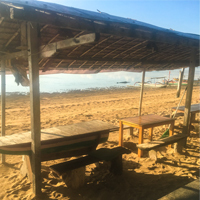 Bali’s best kept secret, until it was published in the Lonely Planet, was Pantai Indah in Sanur. Raw and authentic, the ultimate beach shack. Perfect for afternoon Bintangs and letting all your worries go. 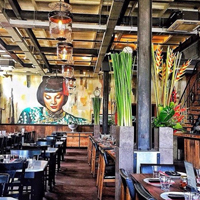 For something fancy and a great cocktail, go to Ku De Ta in Seminyak. Great location to also see the sunset. 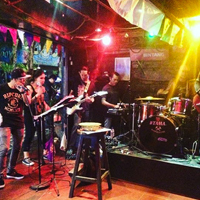 If you want to get down and dirty and belt out a few tunes, the Espresso Bar in Kuta never disappoints later in the night. Bali has turned into a culinary mecca. We have a massive Bucket List of restaurants to try, and doubt we will ever get through them all. There are so many great dining experiences now, that it’s essential to book well in advance for the good ones, or you wont get in. My favourite resturant and it’s a big name in Bali dining, but it’s awesome – Mama San in Seminyak. Great cocktails, cool interior and the food is unbelievable. It’s a must. 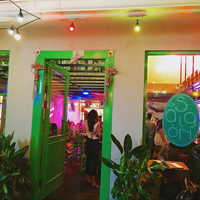 Saigon Street in Seminyak offers a modern Vietnamese experience in a relaxed, modern street style environment. Killer retro tunes pumping too. 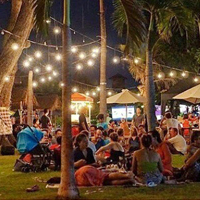 For something a little different and more relaxed, The Sanur Beach Grove offers an outdoor “food truck” style experience. Great family dining and cheap. This is only a start on My Bali. I will continue to share my day to day finds and add to this page. If there is anything in particular you’d like to know about in my day to day living, or holidaying in Bali, let me know!